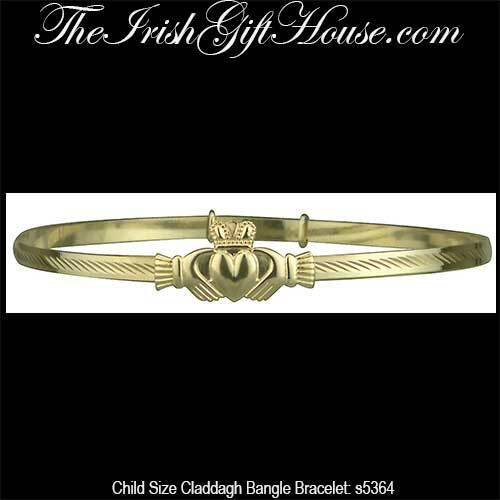 This 14K gold Claddagh bracelet is a child's size adjustable bangle. Sorry, this Claddagh baby bracelet is sold out. This child size Claddagh bracelet is cast in 14K yellow gold and measures 5/16" tall from the top of the crown to the bottom of the heart. 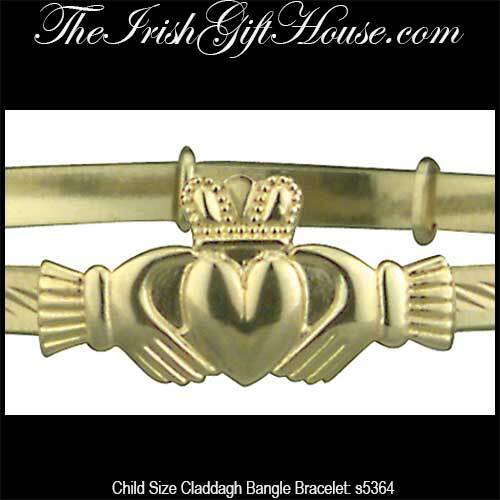 The opening on the child's Claddagh bangle expands from 1 3/4" to 2 1/8" wide. The child size bracelet is made by Solvar Jewelry in Dublin, Ireland and it is gift boxed with a Claddagh legend card that is complements of The Irish Gift House.